I have heard many women ask if it is necessary to neutralize the hair after getting a relaxer. First of all, I never recommend that you do your own relaxers, period. The fact that you are asking this question tells me that you more than likely are not a professional hairstylist and therefore you should not even look at, let alone touch, a relaxer if you are unsure of whether or not neutralizing is necessary. Second, if your professional hairstylist ever skips this step then its time to look for a new stylist. No professional hairstylist will forget one of the most important steps in the relaxer process other than the application itself but I would just like to reiterate just how important it is. Whenever you receive your relaxer, and it is time to rinse the relaxer out, neutralizing the hair comes shortly after. The neutralizing shampoo does two very important things. First, it stops the action of the relaxer. Stopping the action of the relaxer is what allows your hair to not become damaged due to over processing, besides leaving it on too long. Rinsing alone is oftentimes not enough because even though there are no visible traces of the relaxer left, there may still be a residue left on the hair that is undetectable with the naked eye. That residue alone is enough to cause damage even though you can't see any more relaxer on the hair. Second, the neutralizing shampoo brings the hair back down to its normal pH. Healthy hair has a pH of 4.5 to 5.5. Once the hair is relaxed, it raises the pH of the hair so neutralizing it allows it to brought back to normal. It is important that your hair is shampooed with the neutralizing shampoo a minimum of two times. After that you can use your normal moisturizing shampoo or one of your choice and it will not damage your hair. I personally like to use a clarifying or deep cleansing shampoo after the neutralizing shampoo because I like to be extra sure that there is nothing left on the hair. Many neutralizing shampoos will make the suds pink if there is still a residue left on it. Pink suds mean that you should keep shampooing the hair until all of your suds are white. 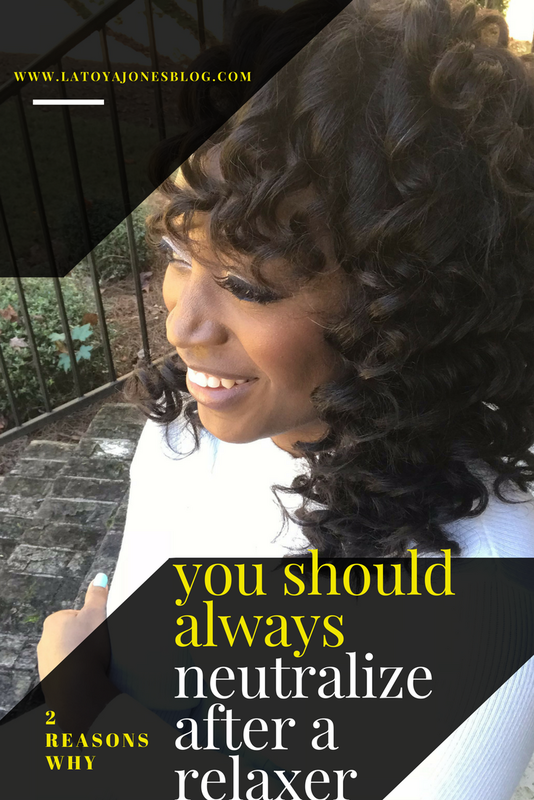 If your hair is not neutralized after getting a relaxer, the result will be that your hair will become very brittle, damaged, and eventually break off. I even go so far as to wipe my shampoo bowl in the salon with neutralizing shampoo as well so that residue will not get on the next client. Now do you see how important it is to always neutralize your hair after getting a relaxer? Always remember that relaxers are chemicals and should be handled properly at all times in order to keep the hair healthy.